It's time...: for a bootcamp update! 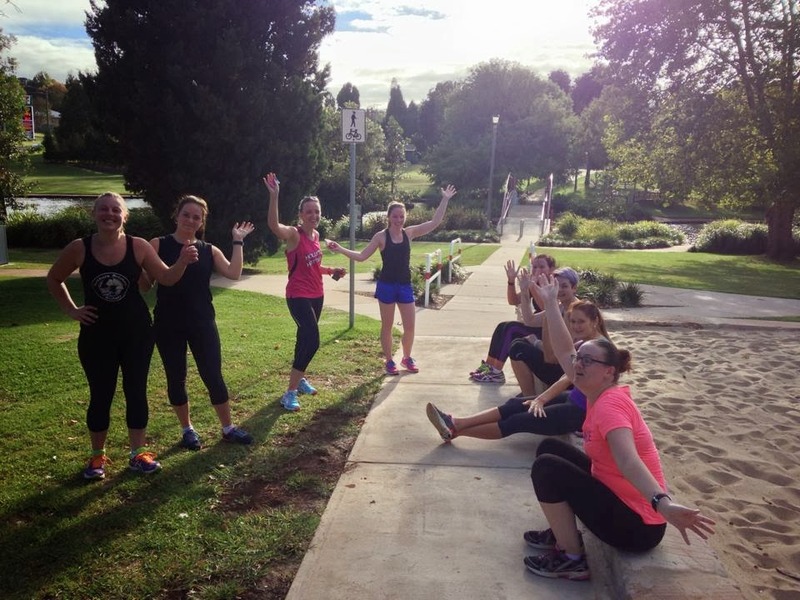 We have just entered week 6 of 8 of our bootcamp and I am enjoying it so much! When I looked back I realised that I haven't done an update since Week 1! I spoke then about the things that I was going to find a bit of a challenge but seem to be managing them ok. I thought it was going to be a big struggle training so late in the afternoon (we train from 6pm-7pm), as I have always considered myself a "sit-on-the-couch-and-don't-get-up" kinda girl in the afternoons but work has been so busy that I pretty much get home in time to just change and run out the door again, so haven't had time to think about not going. There's 18 girls in our group, however for a variety of reasons I don't think we've had a session with the full 18 of us, I guess we probably usually average about 10 girls. I will admit to missing the odd session due to other commitments as well - sometimes things just happen. We have four sessions a week, Monday, Wednesday, Friday nights from 6-7pm and Saturday mornings 6am-7am. We do a wide variety of things which I love, you turn up not really knowing what is in store. I think this is great so that you don't get bored by it. We do a fair bit of boxing but I really enjoy that so I don't mind. I think it's a great whole body workout and have definitely noticed a change in my arms (I not quite ready to claim "guns" status, but am pretty close!). Saturday mornings are usually a little different from the usual training sessions. Saturday just gone we ran the 10km track from the recent Peak2Park event in Toowoomba (a 'fun run' held each year to raise money for different local charities). I was stoked when I finished with a time under an hour! Us after our run! So damn proud of all the girls! what the..? you may ask! So did I when my sister mentioned it. She saw an article shared on Facebook and was intrigued. So was I, so I turned to my trusty Google and Pinterest and came across a plethora of articles discuss this technique. One of the main ones I read was from a blog written by The Wellness Warrior. Basically the idea is that first thing in the morning you put a tablespoon of Coconut Oil in your mouth and swish it around for 20 mins. The oil pulling has a detoxifying effect on your mouth and rids it of toxins and bacterias. I am not claiming to be any type of expert but if you click on the link above you can read more about it. I have only just started and can certainly report that my teeth feel a lot cleaner, not sure they are whiter but will continue to do it and see what happens. I have noticed a few other changes in myself that are listed as benefits of oil pulling but as I am trying a few different things it's hard to know which one is having the effect or if it's a combination of a number of healthy changes. This is something that our trainer has told us about. I am a bit fan of green tea and usually try and have a cup every morning but this takes it to a whole new level! Each sachet claims to be the equivalent of 20 cups of green tea which, as we know is full of antioxidants and other healthy goodness! The website claims that the product may increase metabolism, increase your energy levels, detox the liver and kidney and is full of trace minerals and vitamins C & D. It is also sugar free, gluten free and diabetic friendly - gotta be happy with that! It comes in different flavours and I bought the 'starter pack' which contains 30 sachets in total - 10 Original, 10 Raspberry and 10 Tropical Flavours. Again I have only been on it for a few days so time will tell.. Overall I have been happy with my progress with the bootcamp. There have been times that I have slipped up with my diet but for the most part it has been good. I am definitely a sucker for chocolate. It is my weakness.... I can forgo sweets, cakes, biscuits all of that, but put some chocolate in front of me and I can't resist.... I wonder what my progress would be like if I could but then we need to have some pleasures in life! Bootcamp sounds like FUN!! I bet you are seeing some great results! Good on you for trying the oil pulling, the idea makes me want to gag! Love, love, love my bootcamp, but I am no where near fit enough to run 10k's. Congratulations, that's a huge run!! My daughter uses oil pulling every day, and has found some wonderful benefits, including the clearing of her teenage skin. Coconut oil is amazing stuff. Oh that booster looks cool. I'm not a fan of green tea, but I might be able to get on bored with a raspberry flavoured booster. One day I would love to of boot camp, but with my recent ankle inury, I get the feeling it will be a while before i do anything! Awesome work on the results from Boot Camp. The oil pulling sounds intriguing.